Why Choose Novatia for your NMR Needs? Novatia’s NMR spectroscopists have combined industrial and academic experience of over 50 years ranging from polymers, pharmaceuticals, natural products and biomolecules. If NMR can solve your problem, Novatia can help. There are two equipment factors to consider when selecting a NMR vendor: magnet field strength and probe technology. These factors directly affect the resolution and sensitivity – and therefore the quality – of the collected data. A higher field strength instrument will provide better resolution and sensitivity. Better resolution means less peak overlap in your spectra, and easier interpretation. Better sensitivity means more signal and less noise. In practice, the most useful benefit of collecting data at higher field strength is increased sensitivity. Probe technology also affects sensitivity. Cryo- or cold probes are about 2 (nitrogen-cooled Prodigy cryoprobe) to 5 (helium-cooled cryoprobes) times more sensitive than room temperature probes. 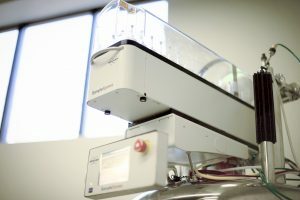 Novatia’s NMR instrumentation is a 500 MHz Bruker Avance HD III with a Prodigy BBO Cryoprobe. Novatia’s NMR will collect comparable signal intensity to a room-temperature 800 MHz NMR on the same timescale, and to a 300 MHz NMR in 1/16th the amount of time. Many labs offer Mass Spectrometry, fewer offer NMR Spectroscopy and only a handful integrate MS and NMR with isolation and identification expertise. Novatia fits into the third category, offering rapid and reliable isolation and elucidation of impurities in active pharmaceutical ingredients (APIs), Drug Product stability samples, and metabolite mixtures. Novatia has been providing NMR services to researchers for over 15 years. Our purpose is to help customers solve their research problems. Our experienced staff offers “full ownership” of research problems by designing an experimental approach, then collecting, analyzing and reporting the interpreted results in a research report. We also offer “data only” service where we collect the NMR data using state-of-the-art instrumentation and deliver the results via our secure website. We Either way, Novatia is focused on answering questions and supporting our customers’ research efforts.